A trip to New Zealand ranks high on any adventurer’s bucket list of destinations. Both islands, North and South, boast incredible locations for outdoor exploits, from snow-packed peaks and dense sub-tropical forests to sunbaked beaches and freshwater lakes. First we highlighted how to spend five days on NZ’s North Island. Now we’re outlining the ultimate travel guide to the country’s South Island, focusing on the Nelson Tasman region. You’ll enjoy stunning vistas of breathtaking wilderness and the company of raucous, progressive, beer-loving kiwis. This 55,600-acre park is the smallest in the New Zealand system, but boasts loads of amazing locales—granite outcroppings jut out of dense forests haloed by golden beaches. The climate here is mild and the wildlife is abundant with endemic birds flitting through the forests and seals hanging out in the offshore marine reserve. Your best bet is Air New Zealand, which has won countless accolades over the years—most notably in 2017 when they nabbed Top Airline in the World by Condé Nast Traveler readers. They’ve also won Airline of the Year by airlineratings.com for the last four years. They provide plenty of affordable flights out of the U.S.—and best of all, the flight attendants are cheery and attentive. Sit back and enjoy some free-flowing wine and New Zealand delicacies in Premium Economy, which has wide, reclining leather seats. Dare we say it: You’ll actually enjoy the ~14-hour trip to Auckland. Once in Auckland, take a turboprop into Nelson to get to the South Island. The flights are quick and easy, and feature Air NZ’s famous in-flight Brain Teasers and CookieTime snack. 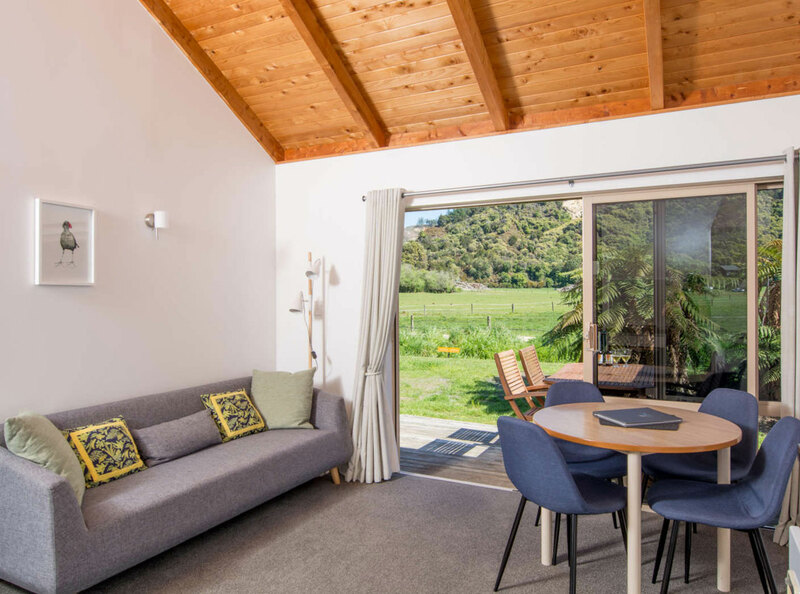 The Abel Tasman Lodge in Marahau offers clean, modern abodes, including single room studios and two-bedroom chalets. All feature free WiFi and parking. Bedrooms are stylish and airy with outdoor spaces that include Weber grills and private decks that overlook gardens and parts of the national park. In fact, that’s its best-selling feature: The Lodge is just 400 meters from Abel Tasman National Park, making it the perfect base camp. Other adventure options close-by include canyoneering, skydiving, mountain biking, fly-fishing, and hiking. Pro tip: Use water taxis to access multiple trails from the beach without having to put in long hours on your feet. This kayak outfitter—just 100 yards from the Abel Tasman Lodge—offers lots of different options for those who want a unique vantage point of Abel Tasman. You can simply rent a kayak by yourself if you seek a more solitary, unguided ocean escapade, or pick from one of the many guided trips. They offer half-, full-, and up to five-day tours with overnight stays that explore the entire length of the Abel Tasman coast. For those who crave a little more variety, there are combo packages that mix kayaking with sailing, hiking, cycling, and/or canyoneering. One of the most popular packages is the Earth, Sea, & Sky, a full-day, unguided trip that starts at Torrent Bay. 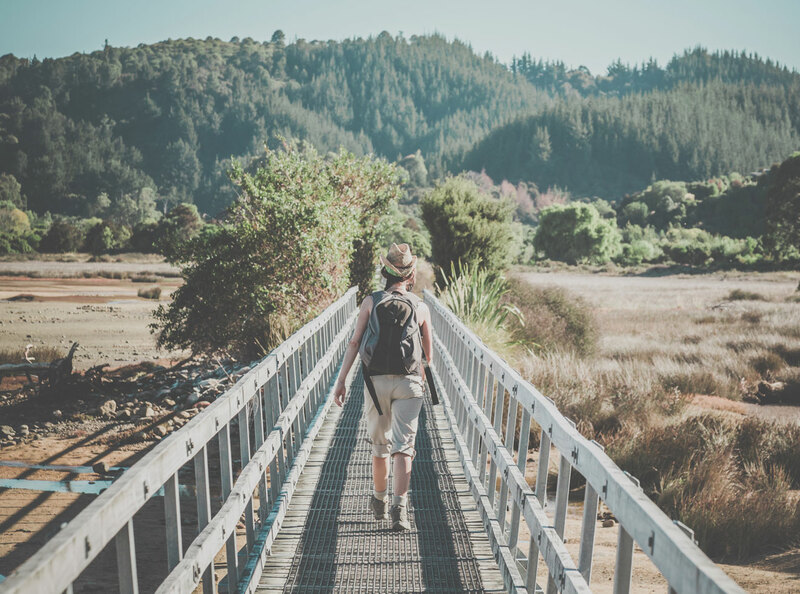 You’ll meander on foot through the hills and forest along the coast, eventually crossing over the famous Falls River Swing Bridge, then back down to sea level at Bark Bay where a water taxi will pick you up for a kayak trip off Observation Beach. 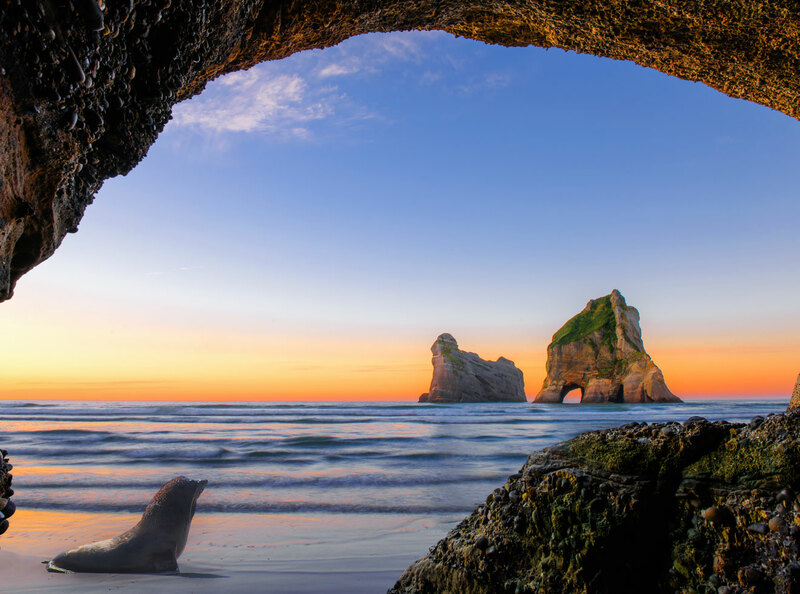 From there you’ll paddle over to the Astrolabe Islands to check out the thriving New Zealand fur seal colony that calls the rocky shore home. Then it’s just an hour or so paddle back to Marahau where beach tractors will pick you and the kayaks up right on the coastline. Nelson’s the second-oldest settled city in New Zealand. It’s widely regarded for its bustling arts and crafts scene as well as its booming beer business. One of the first craft breweries in the world, McCashin’s, started in Nelson, and the surrounding region features over 20 wineries. Nelson is also home to the largest and deepest caverns in the southern hemisphere, so spelunking is a must. Spring for one of the well-appointed studio “apartments” at DeLorenzo’s. The complex has 30 rooms that include all the modern amenities (washer and dryer, WiFi, cable TV). It’s just a five-minute walk to the bustling city hub, which has loads of great restaurants, bars, and shops to peruse. Head northeast to check out Founder’s Park, which has a hop-and-beer museum and a maritime museum. For a perfect late-night nosh after visiting some of the local watering holes, like The Free House and Sprig & Fern tavern, head into the Urban Eatery and Oyster Bar for local seafood. The menu changes regularly with the season, but mainstays include a rotating list of succulent oysters, ceviche fish taco, organic chicken pate, roasted lamb neck, pork cracklings, and a large range of local brews and wines. They don’t accept reservations, so be prepared to order a drink and wait. The founder and chef, Matt Bouterey, is a Michelin-trained cook whose worked with some of the best chefs around the world; he’s dedicated to highlighting the Nelson Tasman area’s local fare. 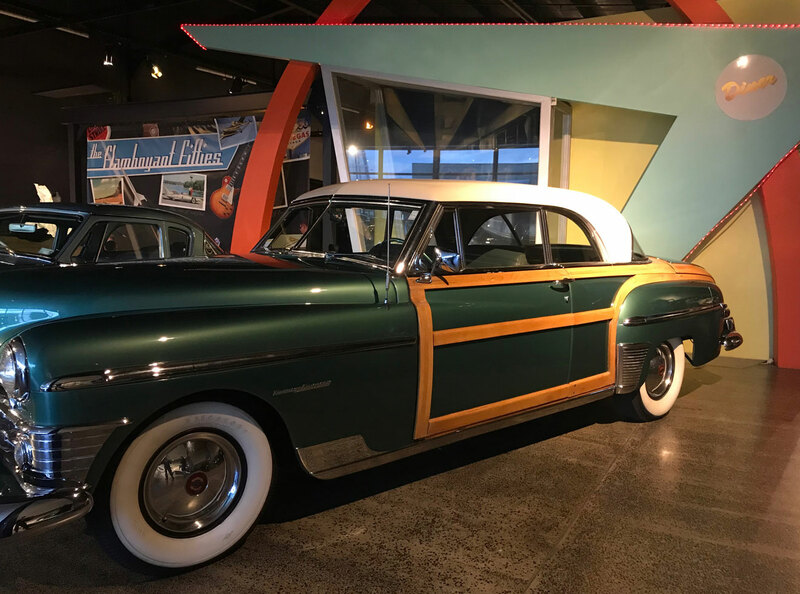 If you want a break from all the drinking, hiking, and kayaking, make a point to stop at the WOW Museum & Classic Cars Collection. WOW stands for “world of wearable” art. But don’t be fooled, the wearable art exhibition—which is in the front of the museum—is stunning. After, head out back to the classic car collection that’s housed in a former cotton mill turned Triumph assembly plant. There are more than 120 cars put up for viewing by a local collector, including some rare cars. Standouts include a 1953 convertible Cadillac Eldorado that’s one of only 532 made; a 1908 Renault; and 1937 Cord 812. An in-house restoration shop, Cartel Works, is responsible for the upkeep and restoration of the huge collection. Perfect browsing through on an overcast fall Saturday morning, the Nelson Market is located centrally in Montgomery Square and features locally made arts and crafts, jewelry, clothing, and handmade soaps. Because of the high numbers of local artisans clamoring to sell at the market, no imported items are allowed to be sold, making a stop here ideal for the discerning tourist looking for authentic New Zealand wares. The market also has plenty of food trucks for some breakfast or lunch on-the-go (the market is open from 8 a.m. to 1 p.m. on Saturdays). You can pick up some groceries while perusing the vendors as piles of local organic foods are available for sale that include cheese, veggies, bread, meat, and seafood.